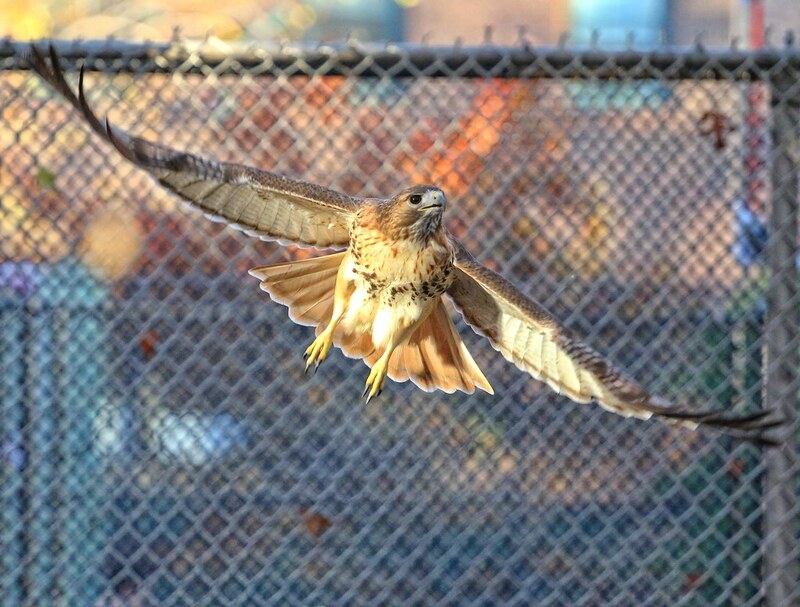 While most of America was thawing turkeys last week, Christo the hawk grabbed himself a fresh butterball pigeon in Tompkins Square. Thanksgiving day was dark and dreary, making it extremely difficult for me to photograph anything. 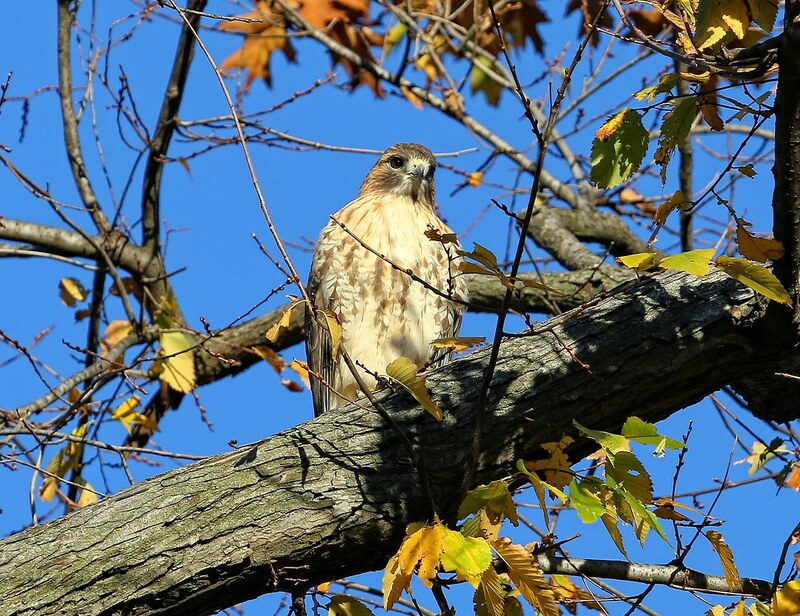 As luck would have it, I encountered three hawks (in addition to Christo and Dora) that day, so I really wanted to document them. All the photos below have been lightened quite a bit in order to see the birds. 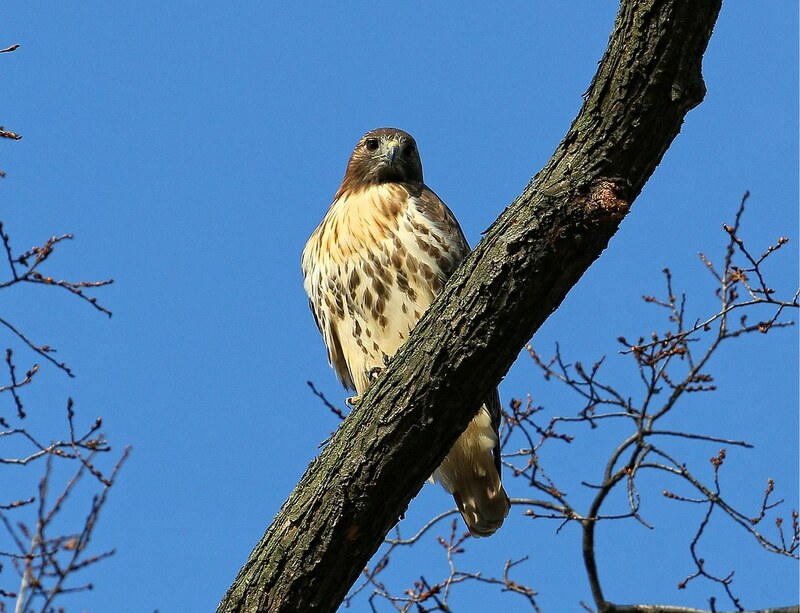 This large juvenile red-tail was perched down on East Broadway. 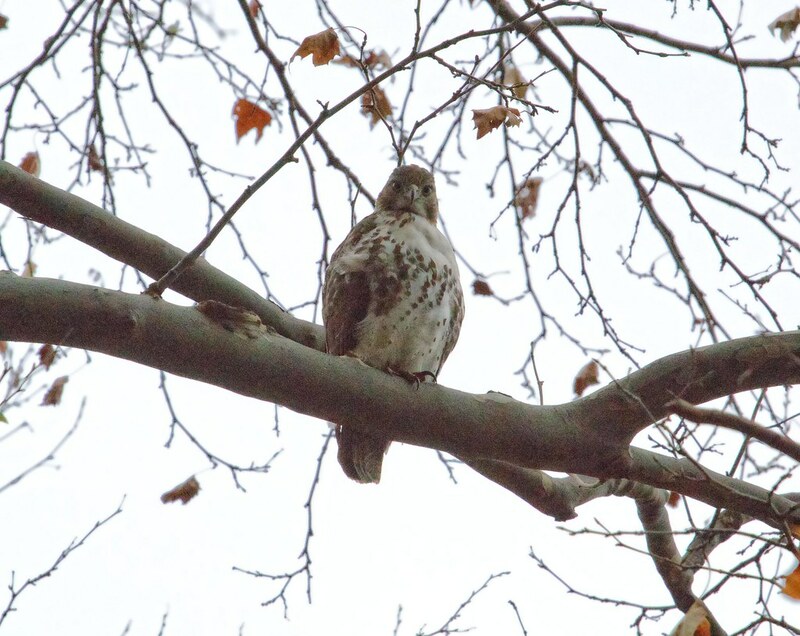 Half a block away, another (smaller) juvenile red-tail perched in a tree. I'd seen it a few seconds earlier being mobbed by crows near the Seward Park library. 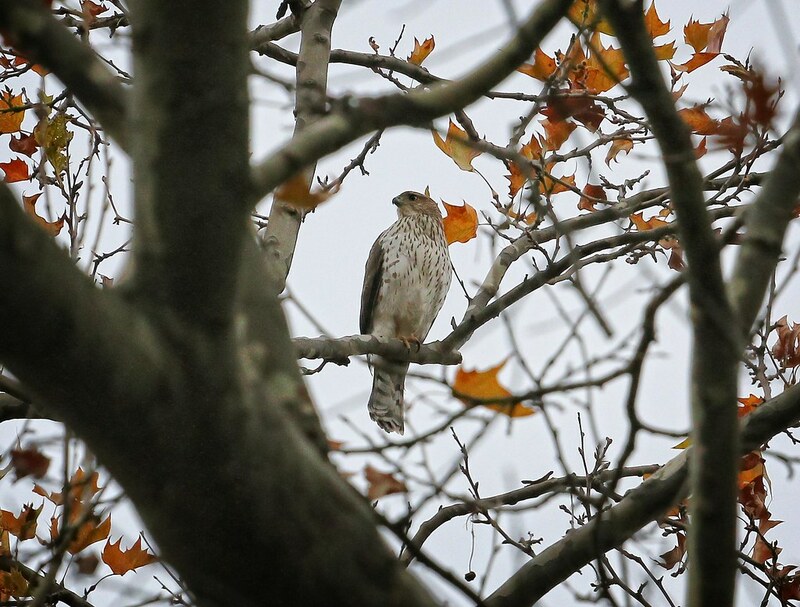 In between the two red-tails was this juvenile Cooper's hawk. 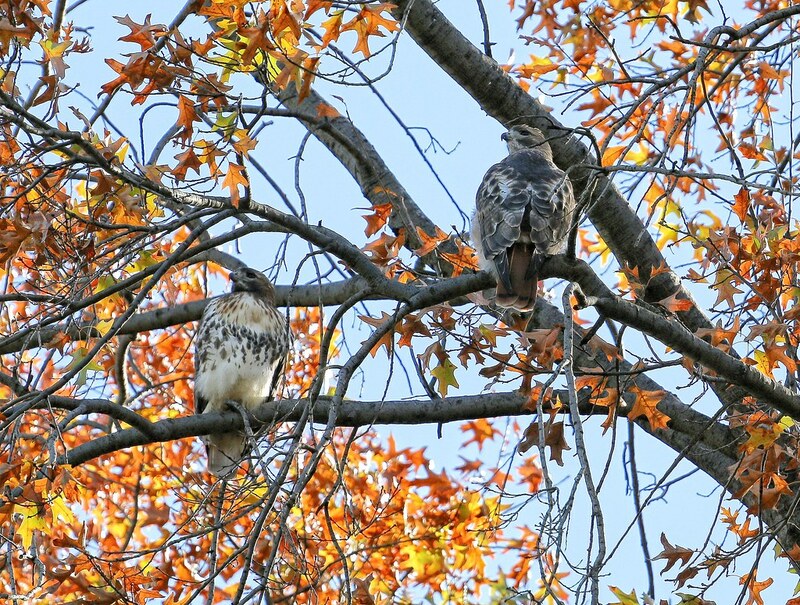 Seeing three hawks in one small area was pretty amazing, especially as they didn't seem to mind each other's presence. 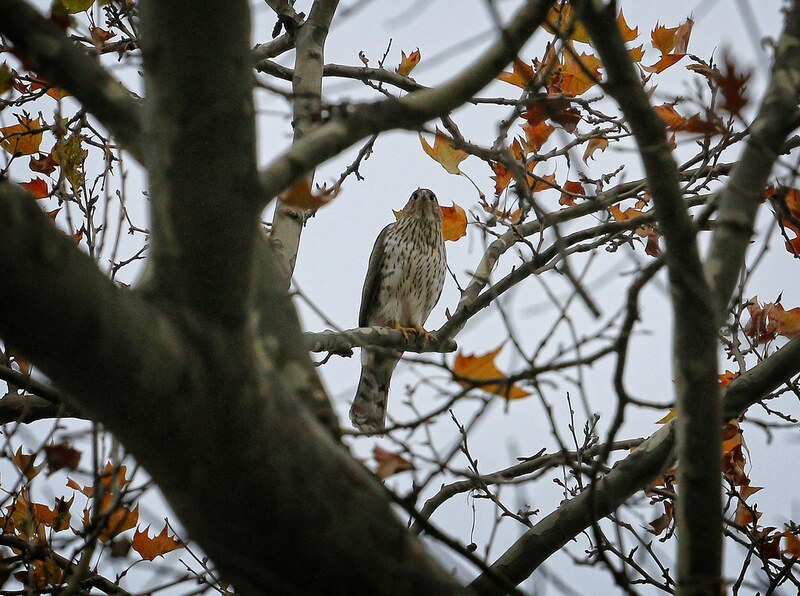 The following day, which was still annoyingly dark, an adult Cooper's hawk hunted in Tompkins Square. 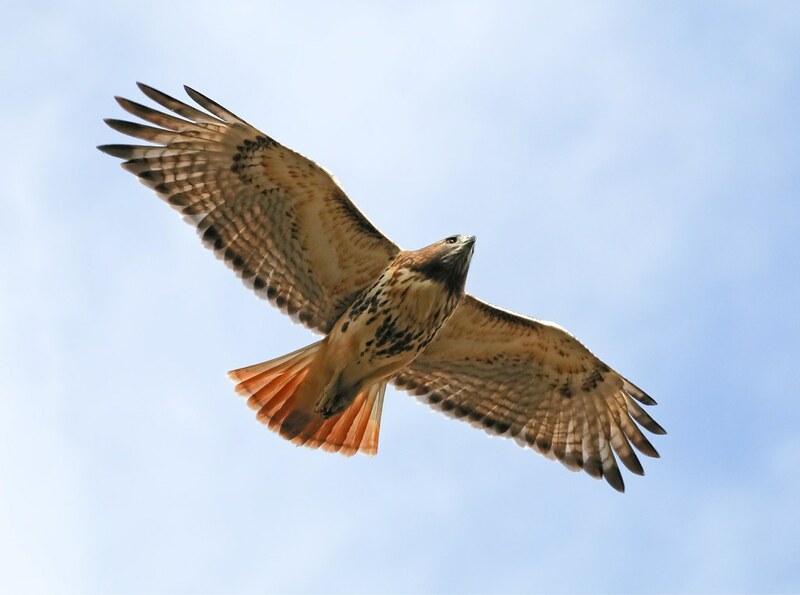 I first noticed it when a flock of pigeons flew by and the hawk slammed into one of them. There was an audible thwack, but the pigeon kept going. From this perch, the Cooper's made a dramatic swoop down and across the Krishna Tree plaza, right along the knees of people sitting on the benches there. It all happened in the blink of an eye, and I failed to be quick enough to catch it with the camera. Every few minutes, the hawk dove at pigeons, but never caught one. Cooper's are such fast flyers, and often perch in places that are hard to see, it was a challenge to keep up with this one. 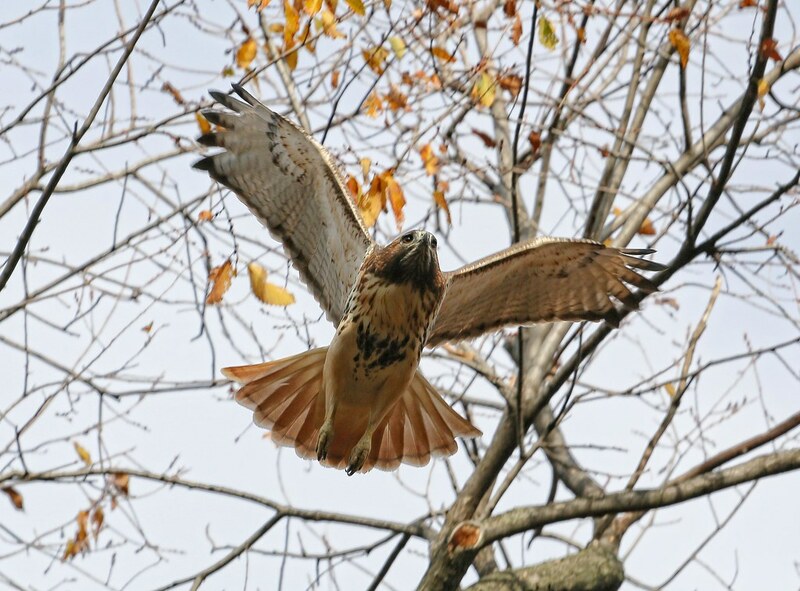 At the end of the day, after several hours of the Cooper's having free reign of the park, Christo flew in and forced the other hawk off its perch. 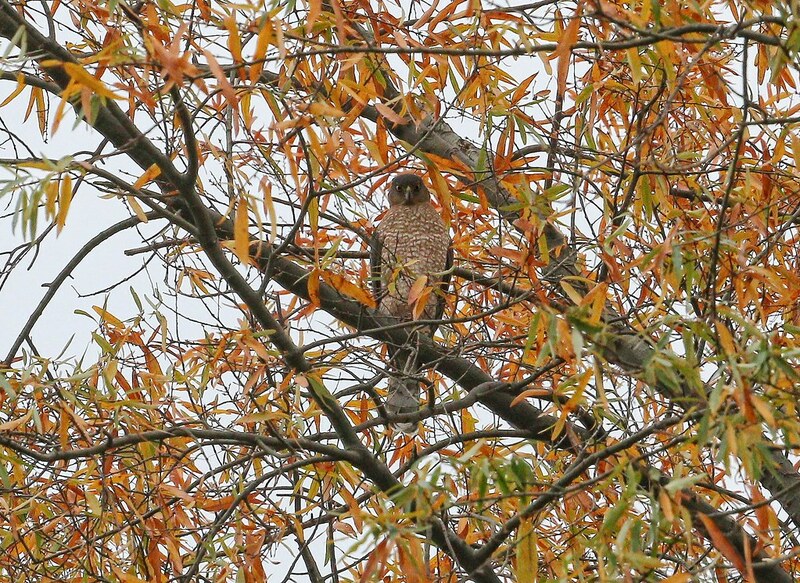 The Cooper's flew to a nearby tree, but wasn't intimidated. 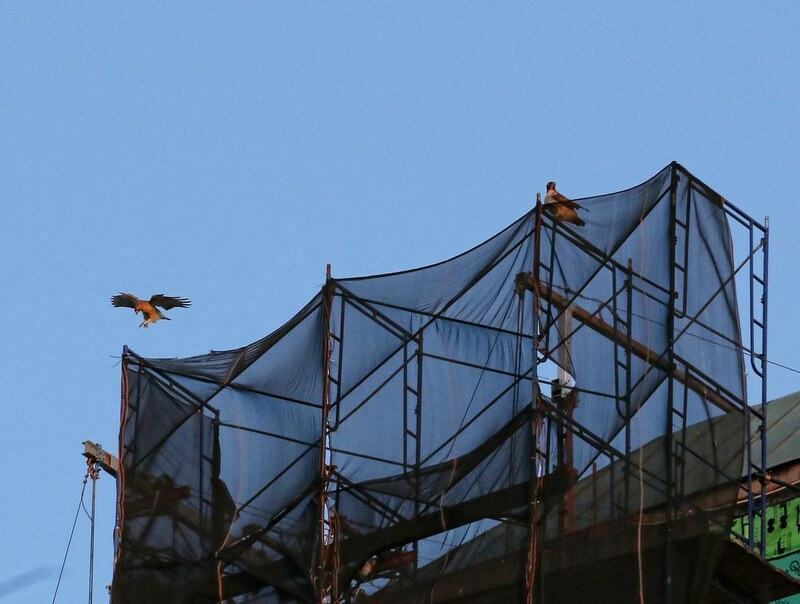 Christo didn't seem interested in pursuing the matter, so they eyed each other for a while before the Cooper's opted to fly right past Christo and out of the park. 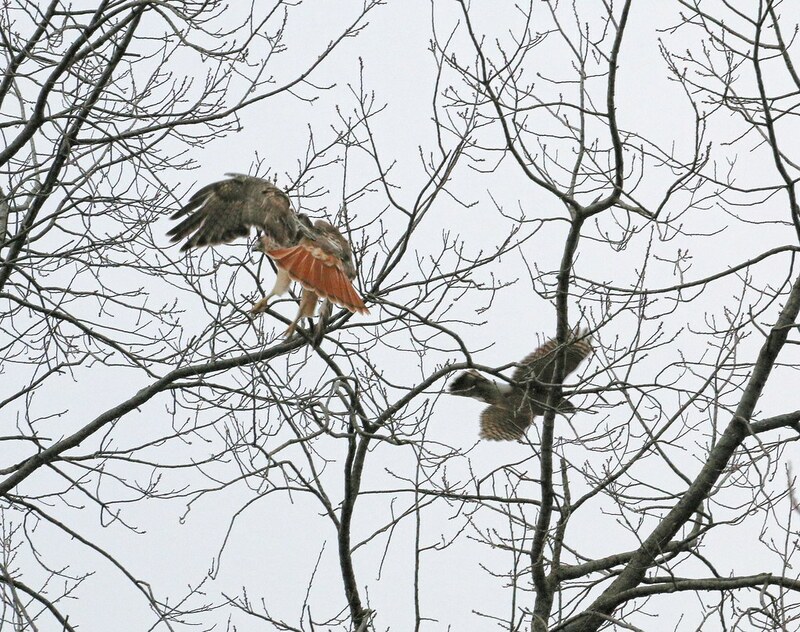 Just as I was leaving for the night, the Cooper's hawk returned to the same spot, and I saw it was being chased by a second Cooper's. 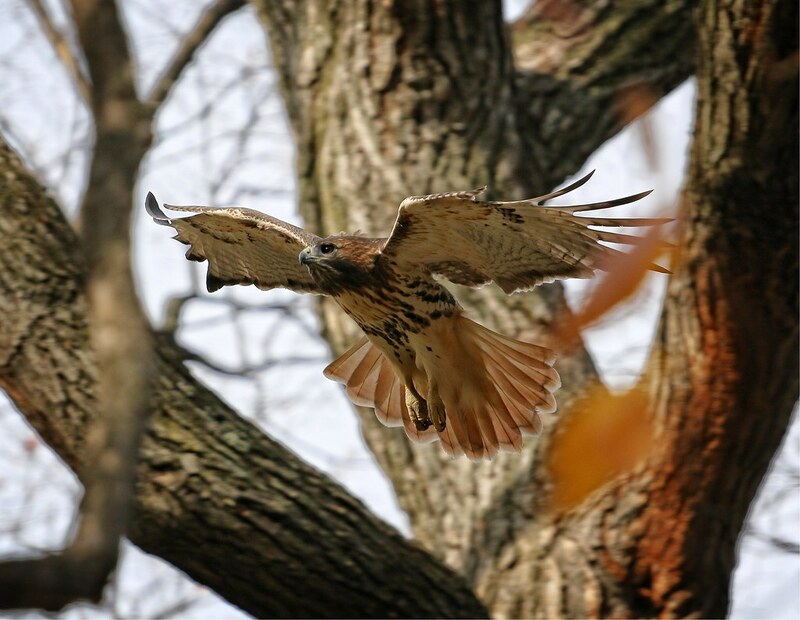 Over the course of the weekend, other hawk watchers and I were able to determine the second Cooper's was a juvenile. There was a brief bit of sunset on Saturday, which Dora and Christo seemed to enjoy from the top of the Christodora building. Wind gusts that day were up to 40mph and Christo let himself be lifted and carried by the wind to the opposite side of the scaffolding. He floated back and forth several times - was he trying to impress Dora or just having a bit of fun? Earlier in the week, Dora had done the same thing in the high winds. 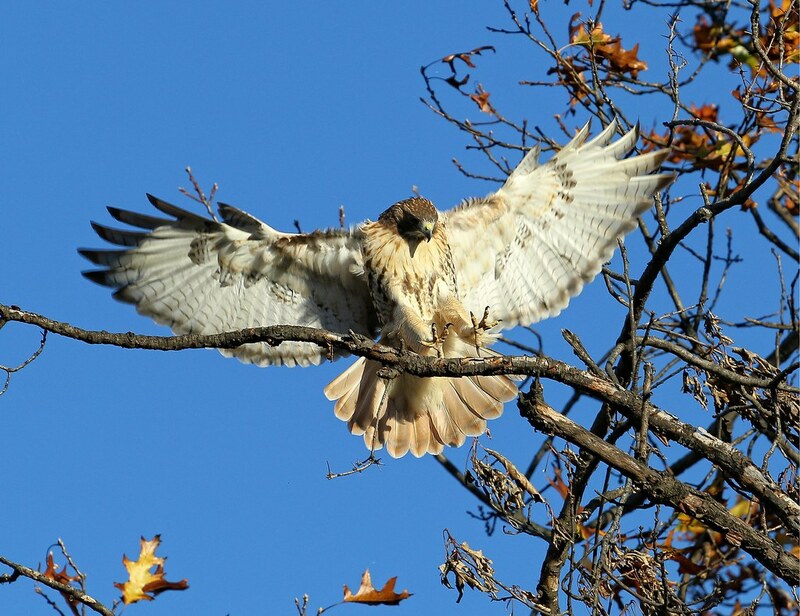 In the photo below, you can see how strong the wind is as it blows the feathers on her chest. 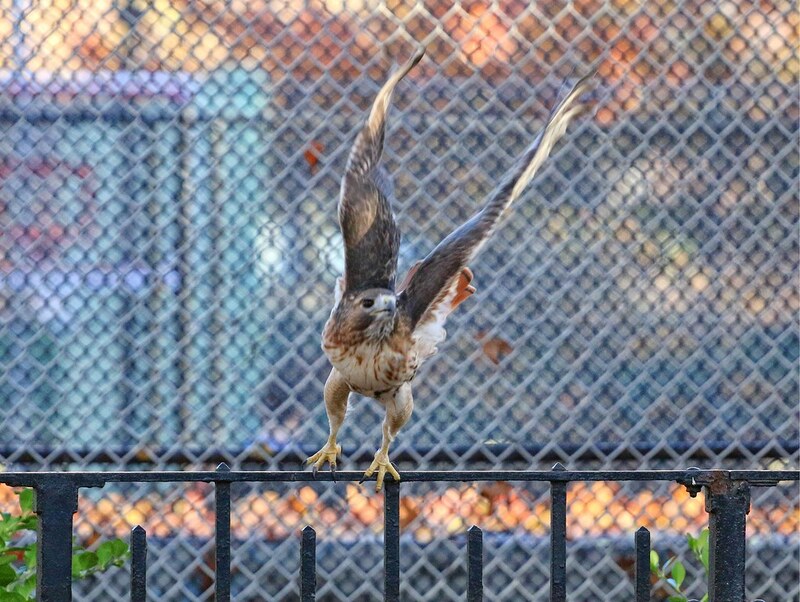 The last week has seen some pretty good hawk activity in/over Tompkins Square. 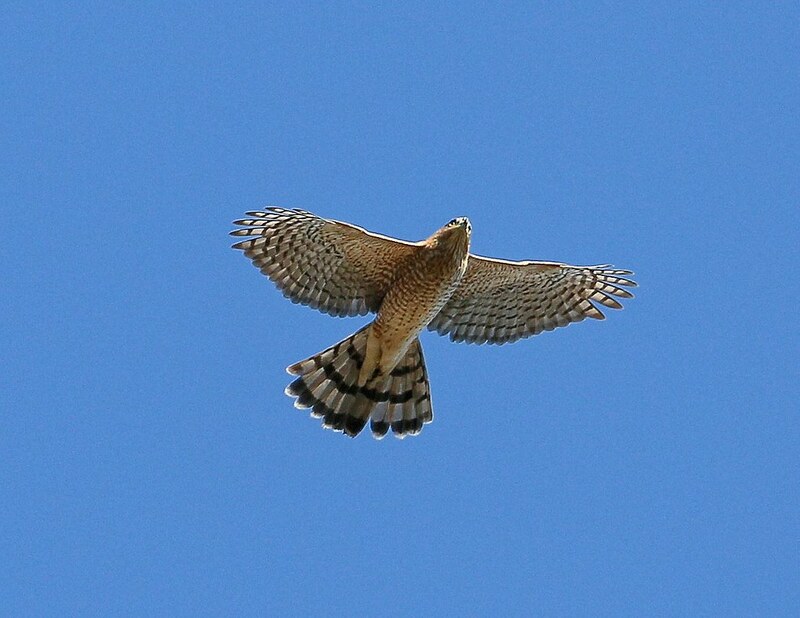 On Sunday, this adult Cooper's hawk was spotted circling over the skateboard area. 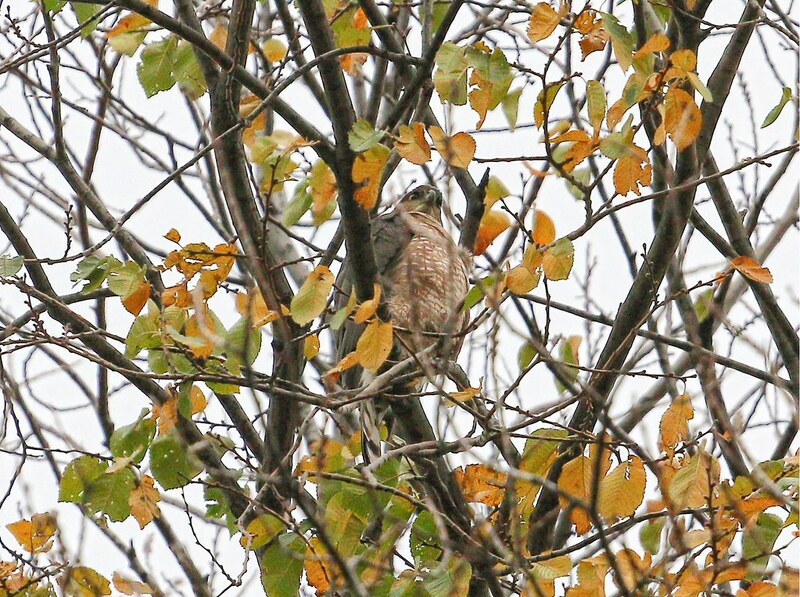 This is not the same Cooper's that was seen in the park on November 5th, which was a juvenile. The Cooper's terrified all the pigeons along Avenue A as it flew around a few times, then headed NE and out of the park. Dora and Christo shared a quiet moment in a tree near the chess tables. 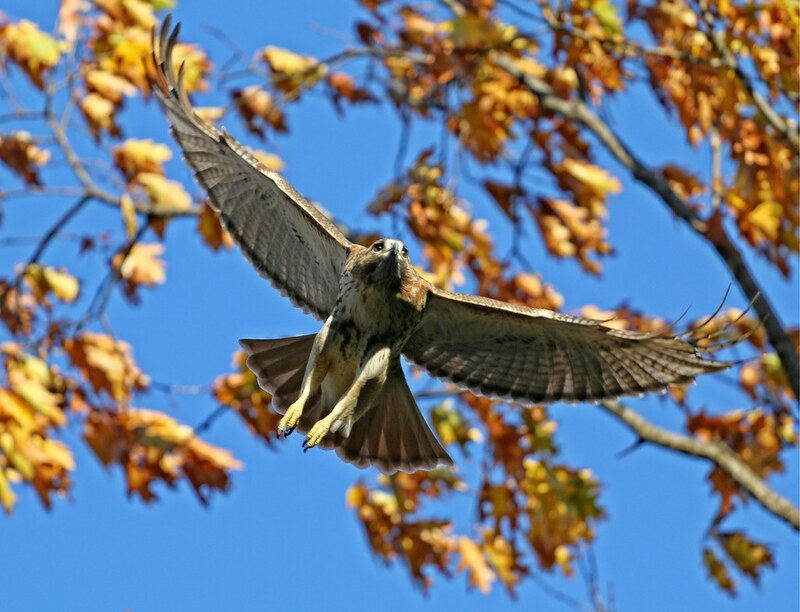 ...then flies off to patrol the park and its dazzling fall foliage. 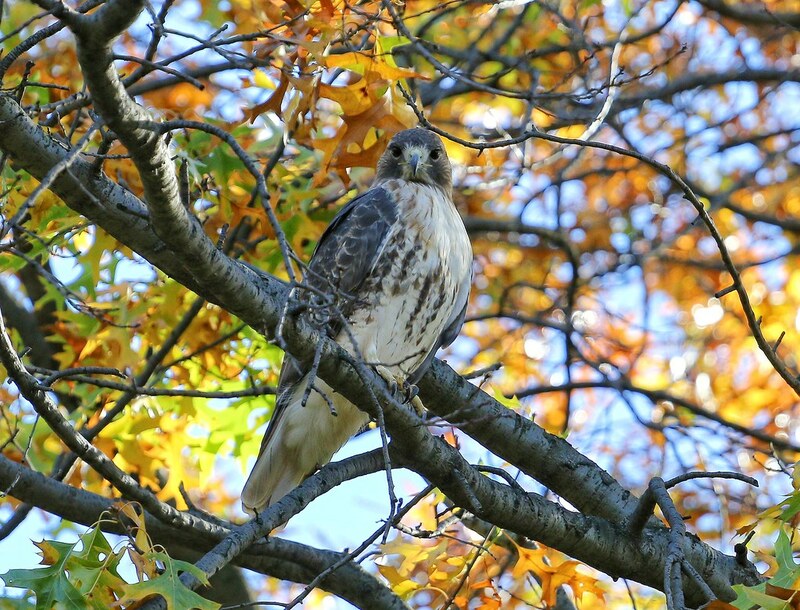 On Monday, Christo ate a pigeon the size of a Thanksgiving turkey on a low branch near the Temperance fountain. 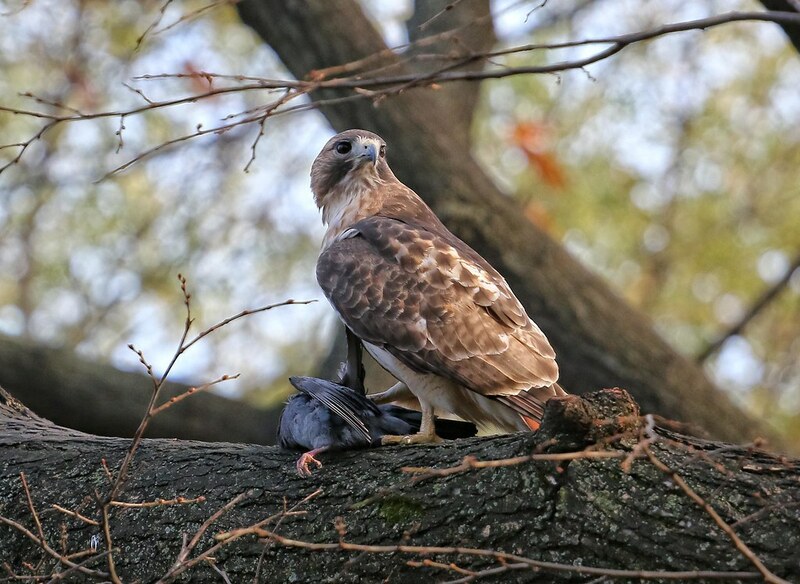 Dora watched him from a nearby tree, and later finished off the leftovers. 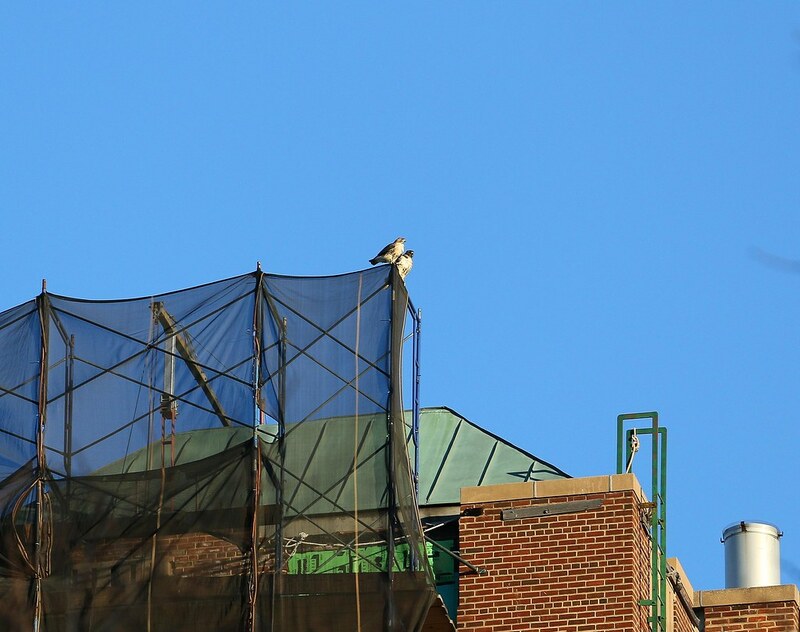 After the heavy meal, Christo flew to the 7th Street entrance to the park where he perched for over two hours, digesting the huge dinner. 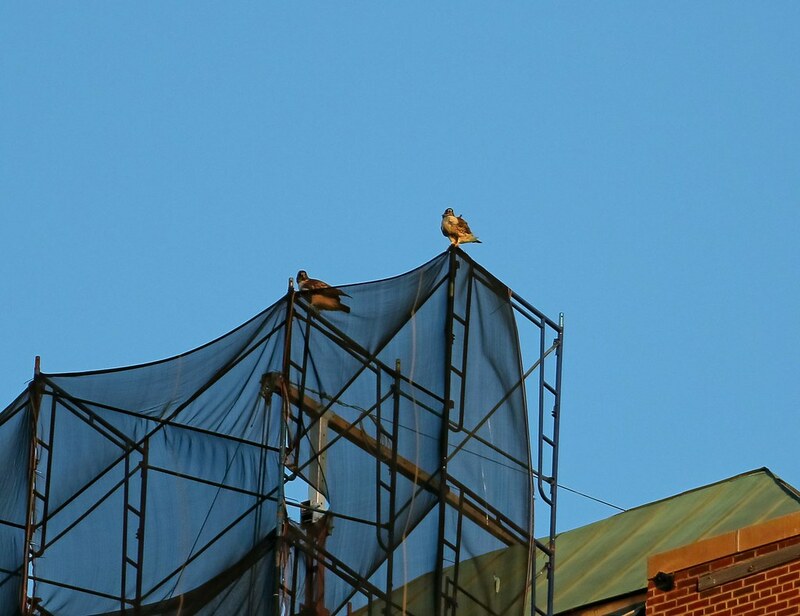 On Sunday afternoon, Christo and Dora perched together atop the Christodora building. You can see the difference in their head color in the photo below - Christo's is a much lighter golden brown (left) while Dora's head is dark (right). 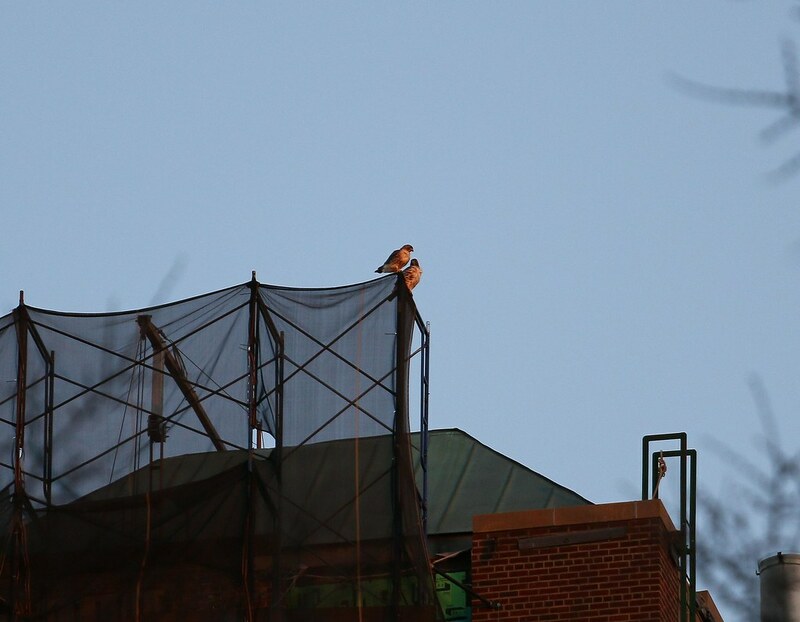 They stayed up there long enough to watch the sun go down. 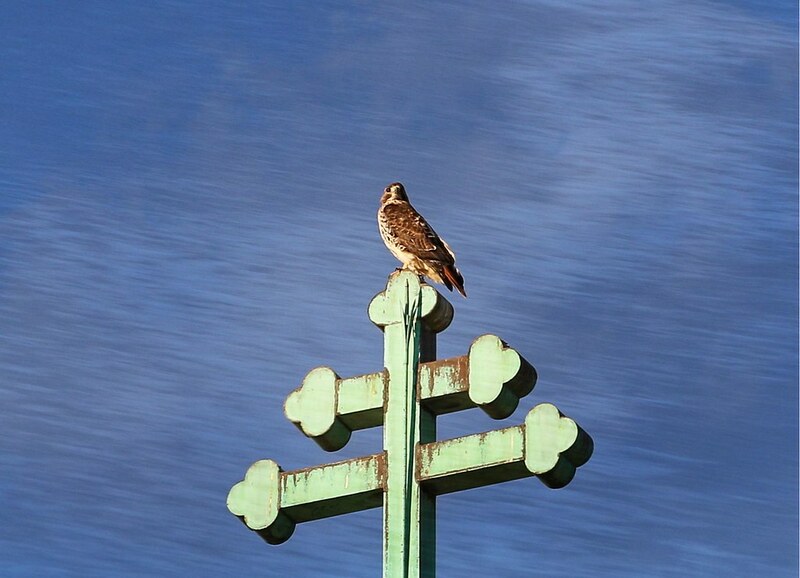 All seems good in Hawk Land. 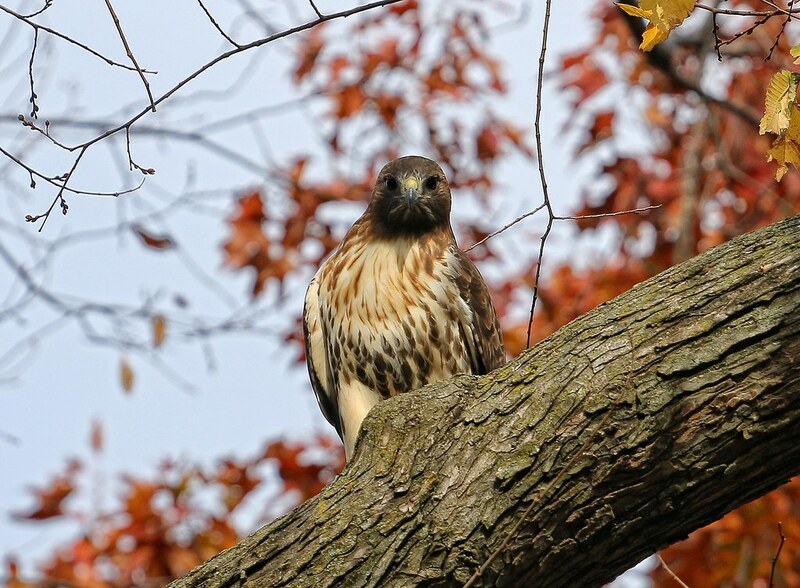 You can see more recent hawk photos here. As promised in my last post, we are focusing on Dora today. Most of the attention usually goes to Christo because he tends to be closer to the ground and people at any given time. Dora is not as tolerant or trusting, and prefers to keep her distance. So, it was a real treat to spend quite a bit of time with her over the last few days. 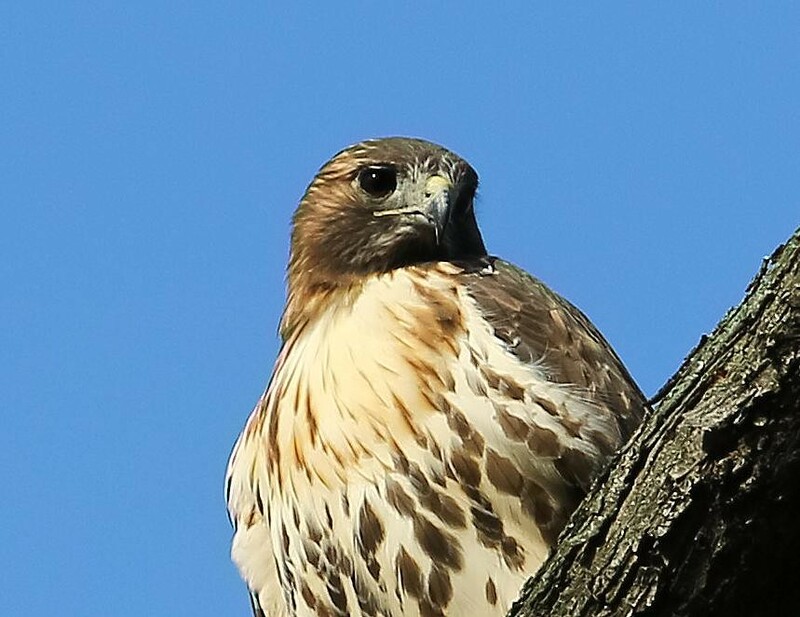 On Sunday, she perched on the cellphone transmitter on Avenue A and St Mark's. I've seen her up there several times before, and it's a popular pigeon hangout. One of her identifying marks (or non-marks) is her plainly colored legs. Below, you can see her legs are a solid cream color, whereas Christo has brown barring on his legs. It's one feature we use to tell them apart. 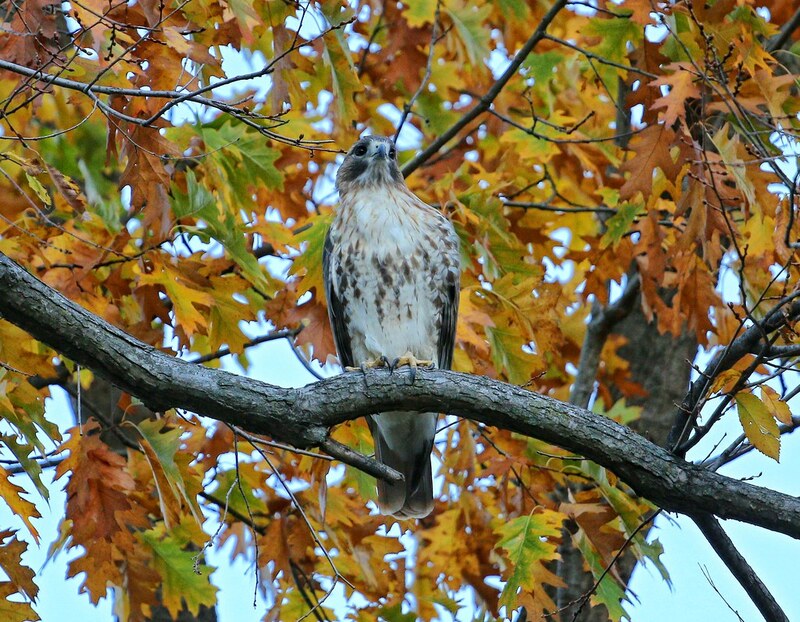 Dora also has a dark head that is nearly the same color as her wings. Christo's head is a lighter golden brown. 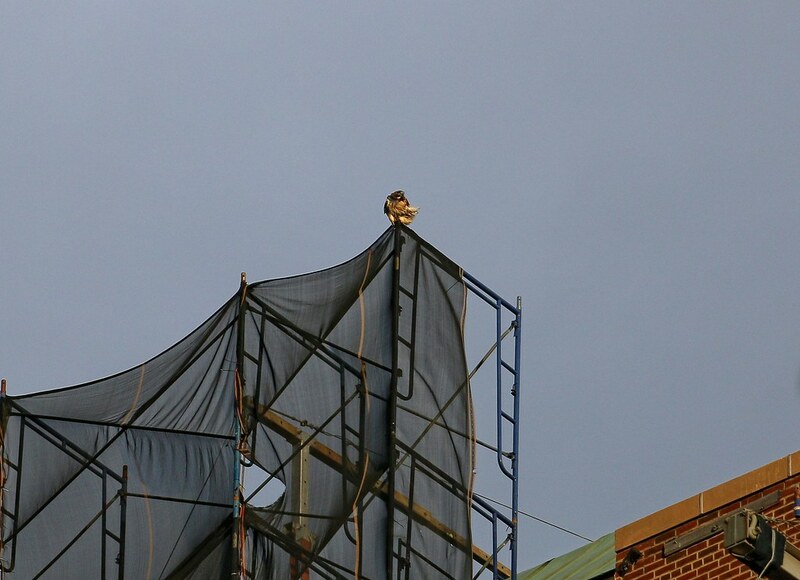 Around noon on Monday, I happened to glimpse Dora relaxing atop one of the Village View buildings at First Avenue and 6th Street. If you look closely, you can see a kestrel perched on the pole on the far right. From this distance, it looks like a tiny round blob. Seconds before, I'd seen the kestrel sneak up behind Dora and slam into her back. She almost fell off the railing. Moments later, when Dora's head was turned, the kestrel made another aggressive move. 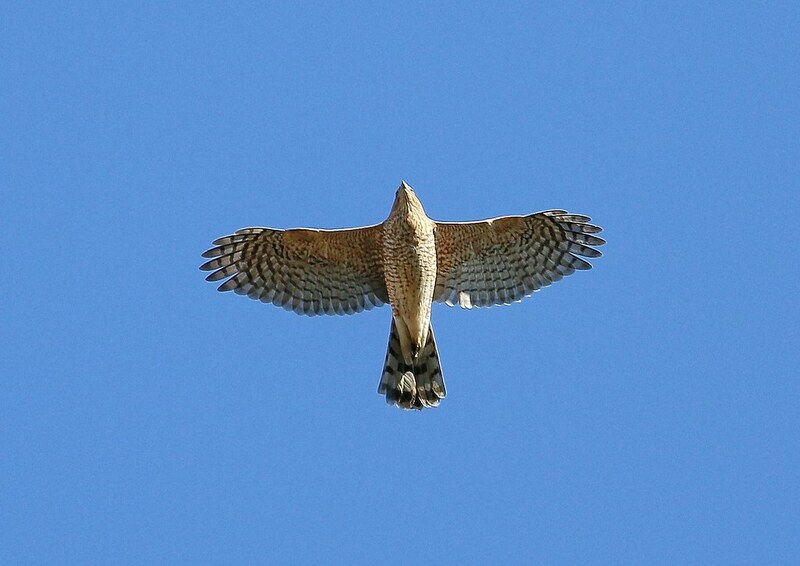 The kestrel took several swipes at the hawk before flying east. 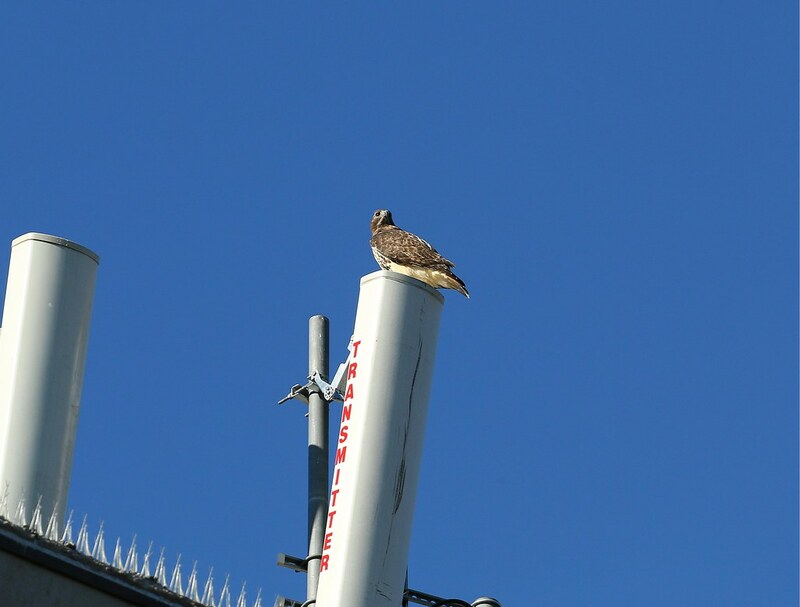 In the photo below, the markings are visible enough to tell us the kestrel is female. 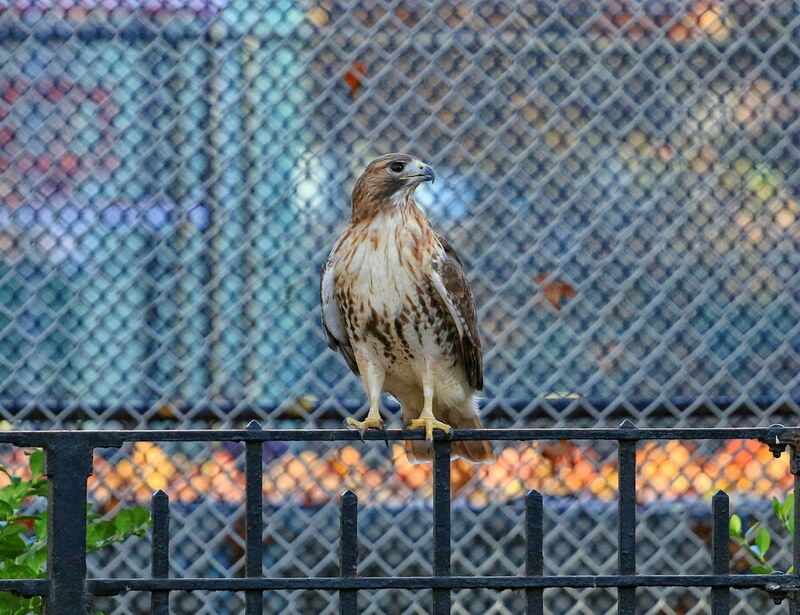 Presumably fed up with being bullied, Dora took off and went to Tompkins Square where she perched out in the open near the Temperance fountain. While she sat there watching a worker sweep the path below her, someone pointed out that Christo was nearby eating a pigeon. Dora was apparently waiting for leftovers. 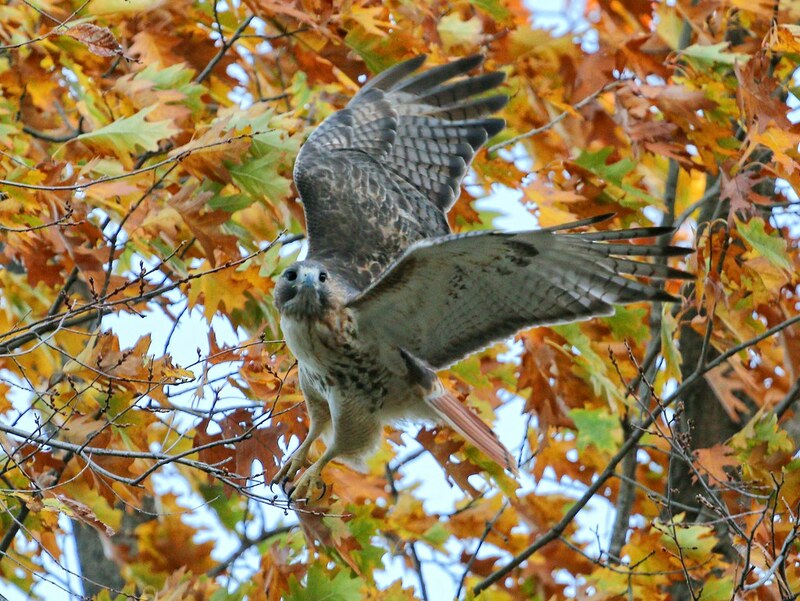 After Christo was done eating, he left the remainder of the meal on a branch for Dora to retrieve. However, I don't think she liked his choice of drop-off location. It was on a very low branch that overhangs the path and some benches, about ten feet off the ground. Christo had no problem eating his lunch there, but I think it was too close to people for Dora to feel comfortable. 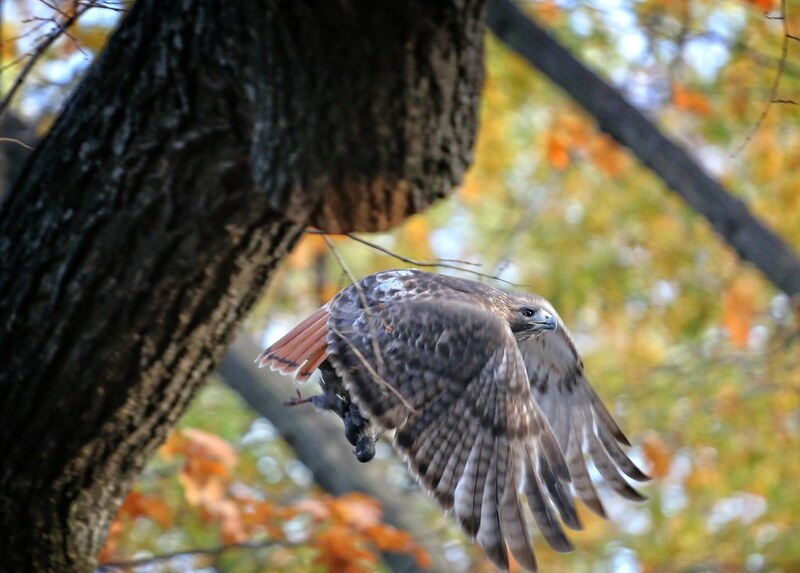 She made two more attempts to fly over the branch and grab the pigeon. 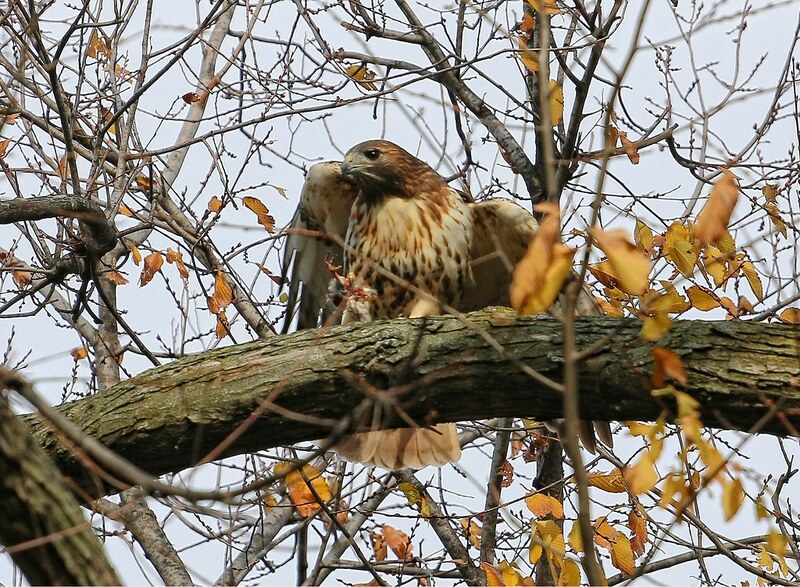 Finally, she caught it and took it to a much higher perch in a nearby tree. 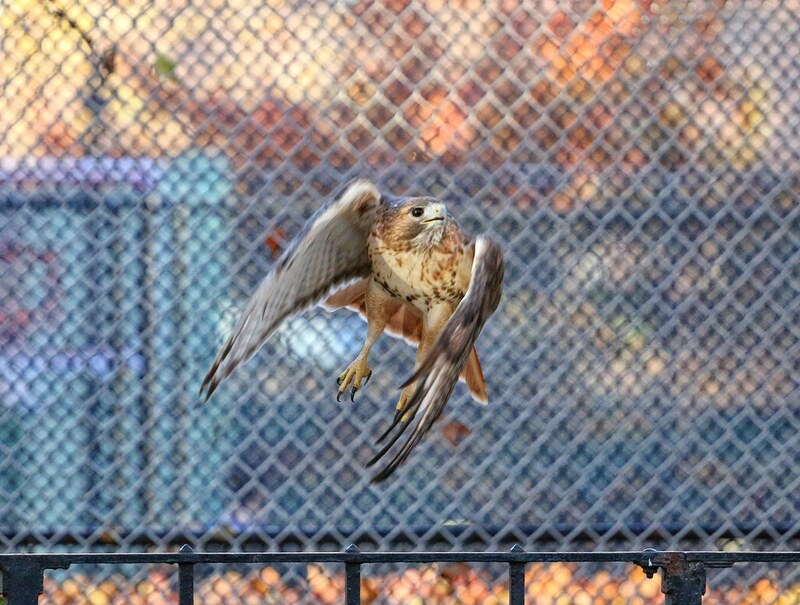 You can see the red pigeon foot sticking out from her right talon. She ate the snack in just a few minutes and seemed a bit restless. 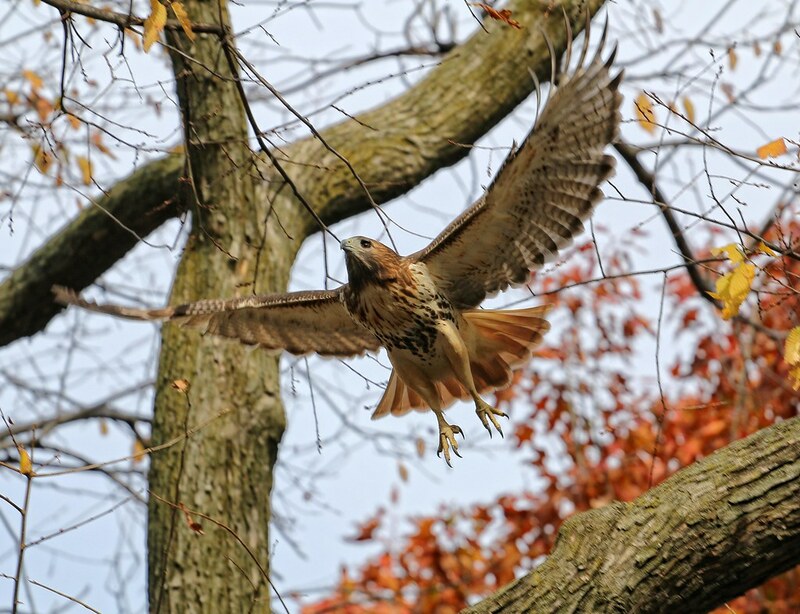 Rather than resting and digesting her meal, she hopped from branch to branch, her attention on something south of the park. Finally, Dora took off and headed out of the park. I didn't see her again until about 4:45, when the sun went down. 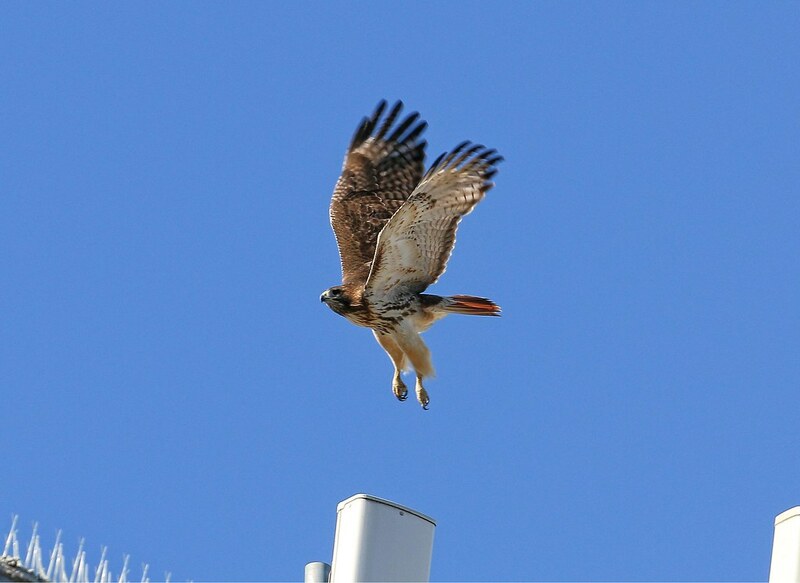 She was perched on a Village View building at Avenue A and 5th Street, where she was again being attacked by a kestrel. 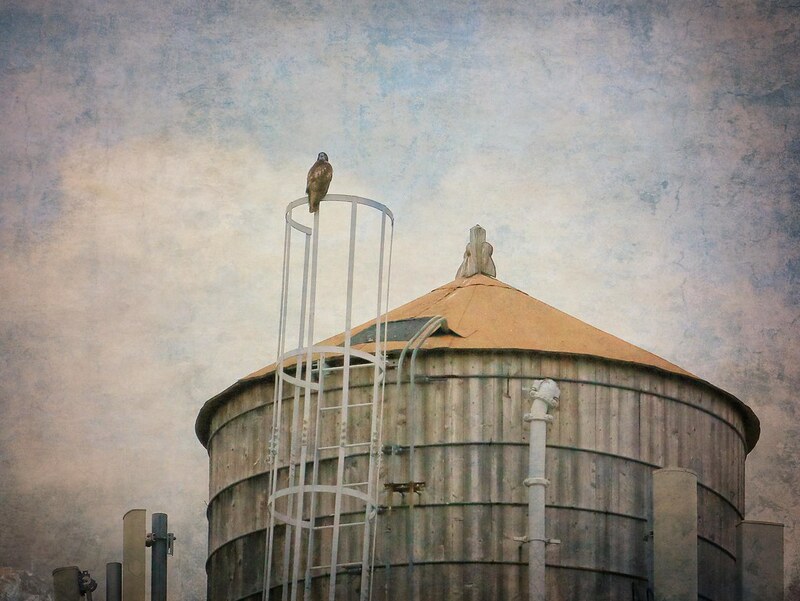 This is not the first (or last) time we've seen the hawks harassed by kestrels. 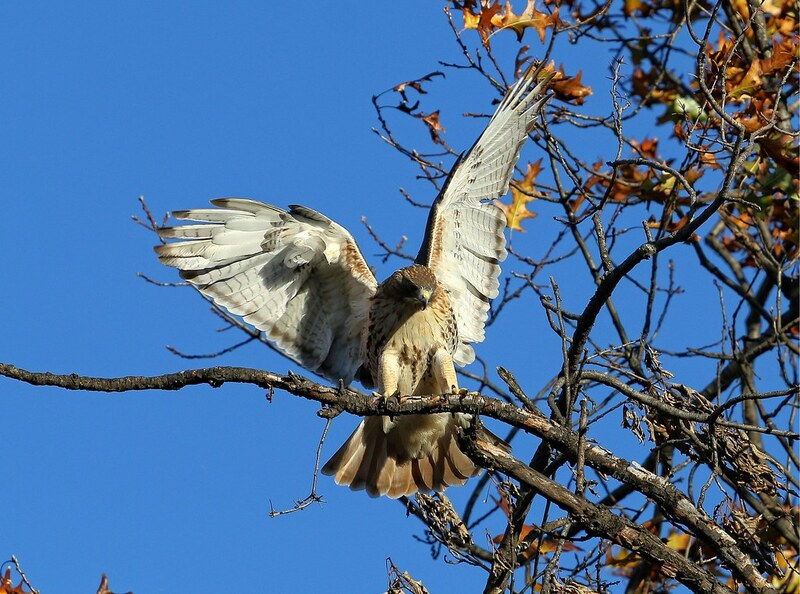 It happens quite a lot as both are territorial and kestrels are little firecrackers. 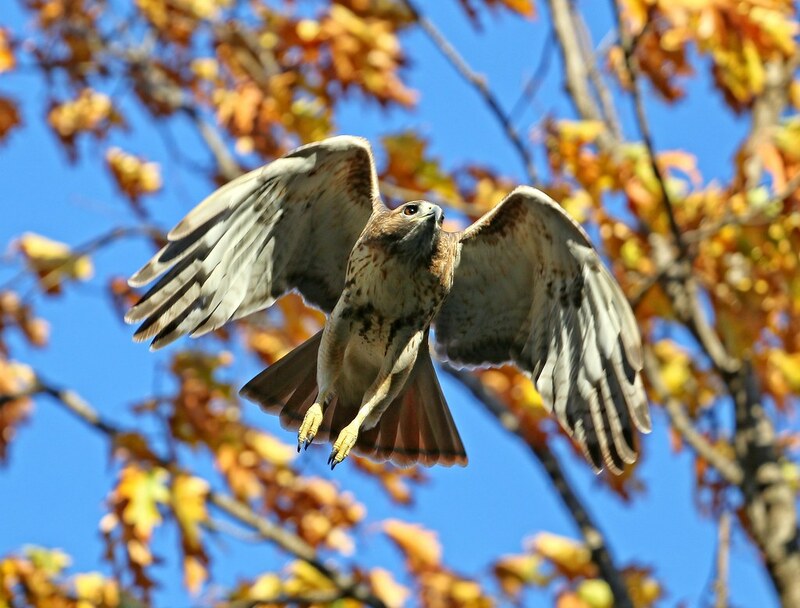 Roger Paw caught a hawk-kestrel scuffle in the area in 2014. 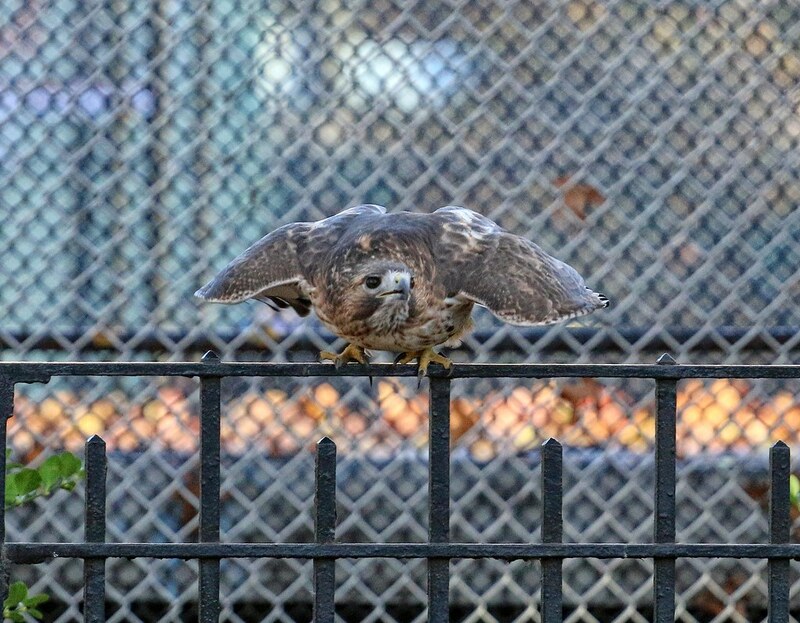 I spent a lot of time in Tompkins Square Park over the last several days where hawk activity has been fairly consistent. 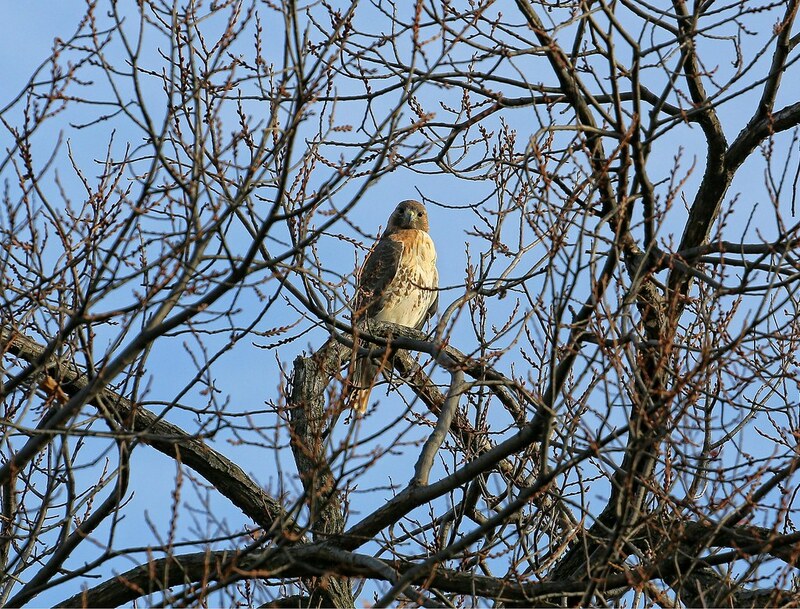 Aside from the resident red-tails, Christo and Dora, I saw at least two Cooper's hawks, a kestrel, a Peregrine falcon and some migrating juvenile red-tails. The autumn foliage is still beautiful, complimenting Christo's plumage. Friday was extremely windy, with gusts up to 40 mph. This made photographing the birds a challenge, as they would catch the wind in their wings and shoot across the park as fast as lightning. 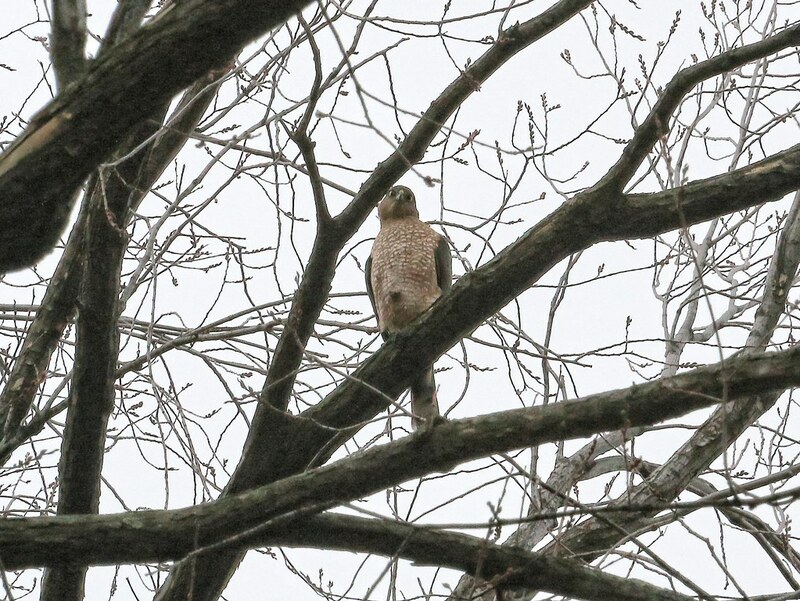 They also had some difficulty perching on branches that would violently toss around in the wind. Below, Christo struggles to regain his balance after being blown off a branch. 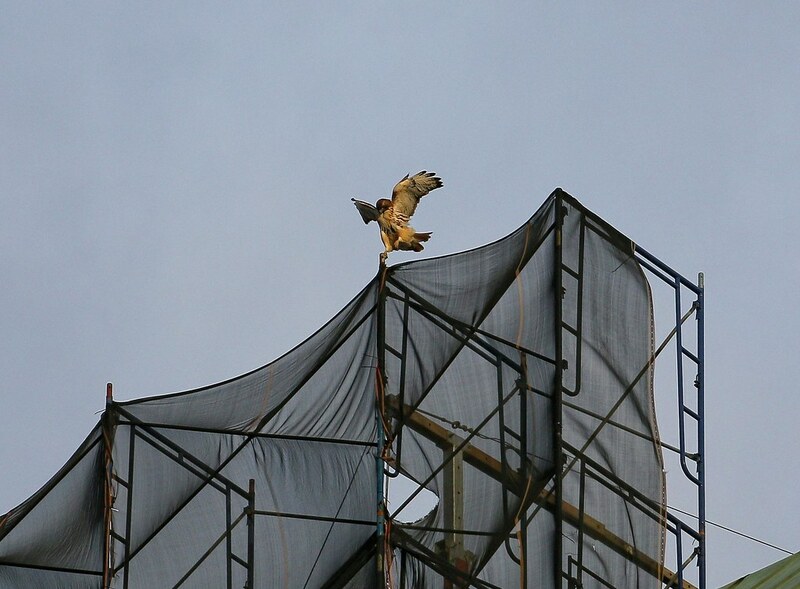 Urban Hawks has some video of Christo maneuvering in the wind. 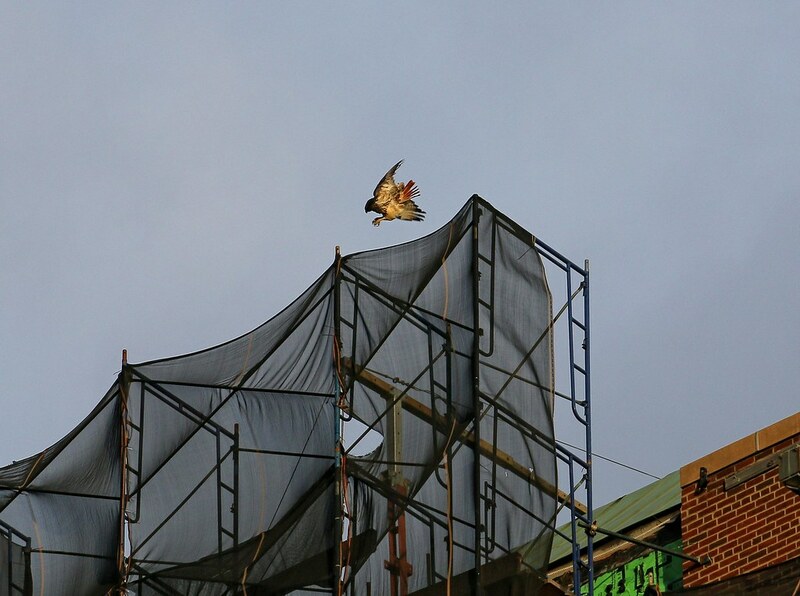 Later that afternoon, Christo appeared to be hunting behind the park offices, but never caught anything. 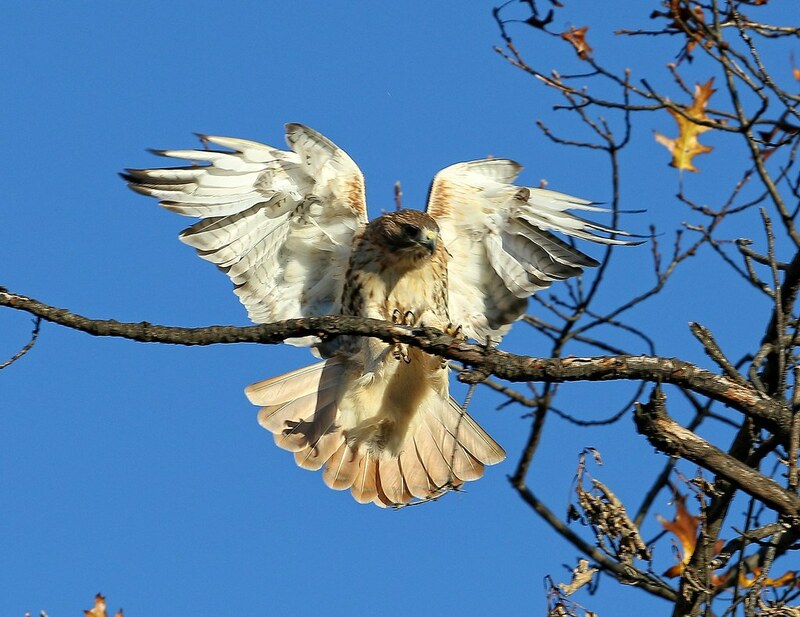 I love watching him take off. 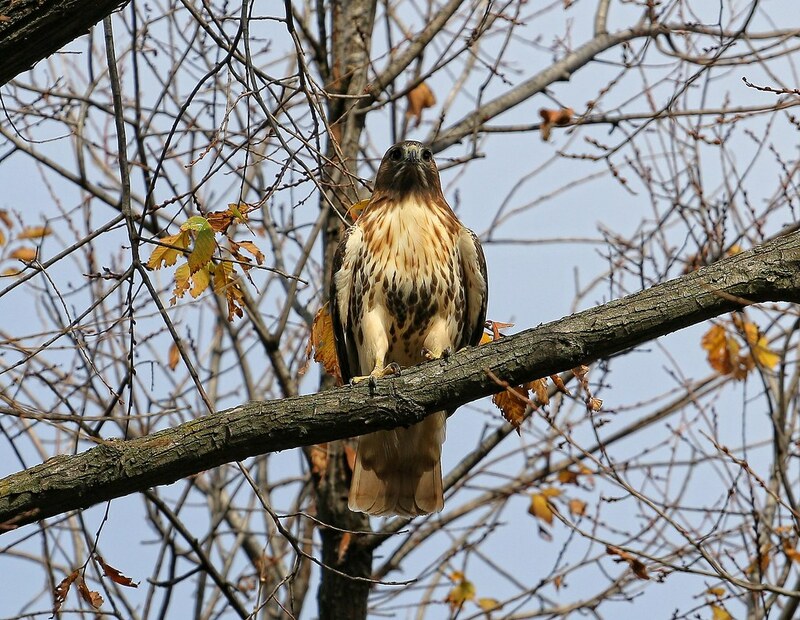 Check out his long talons! 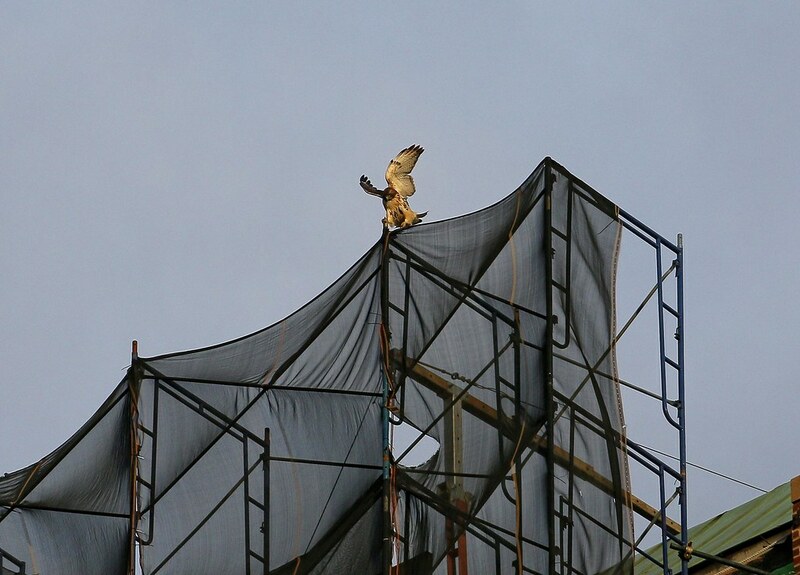 On Saturday, Christo perched atop the cross at St Nicholas of Myra on Avenue A and 10th Street. So, where's Dora? She's definitely around - Christo just makes himself more available for photographs. 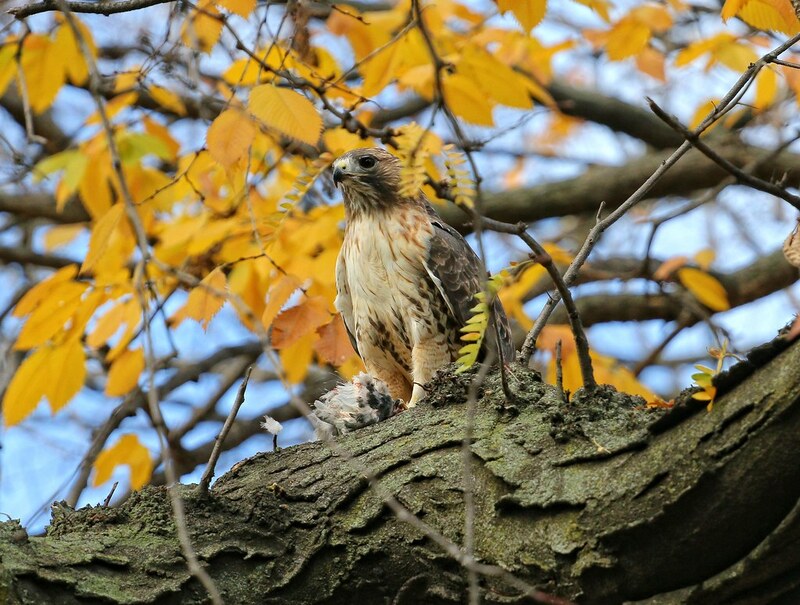 The pair was seen together in the park quite often this last weekend and I'll include photos of her in my next post.